“Research led by the MIT Haystack Observatory finds arctic winter stratospheric events dramatically affect the ionosphere at night. Forecasting space weather is even more challenging than regular meteorology. The ionosphere — the upper atmospheric layer containing particles charged by solar radiation — affects many of today’s vital navigation and communication systems, including GPS mapping apps and airplane navigation tools. Being able to predict activity of the charged electrons in the ionosphere is important to ensure the integrity of satellite-based technologies. Geospace research has long established that certain changes in the atmosphere are caused by the sun’s radiation, through mechanisms including solar wind, geomagnetic storms, and solar flares. Coupling effects — or changes in one atmospheric layer that affect other layers — are more controversial. Debates include the extent of connections between the layers, as well as how far such coupling effects extend, and the details of processes involved with these effects. One of the more scientifically interesting large-scale atmospheric events is called a sudden stratospheric warming (SSW), in which enormous waves in the troposphere — the lowermost layer of the atmosphere in which we live — propagate upward into the stratosphere. These planetary waves are generated by air moving over geological structures such as large mountain ranges; once in the stratosphere, they interact with the polar jet streams. During a major SSW, temperatures in the stratosphere rise dramatically over the course of a few days. SSW-induced changes in the ionosphere were once thought to be daytime events. 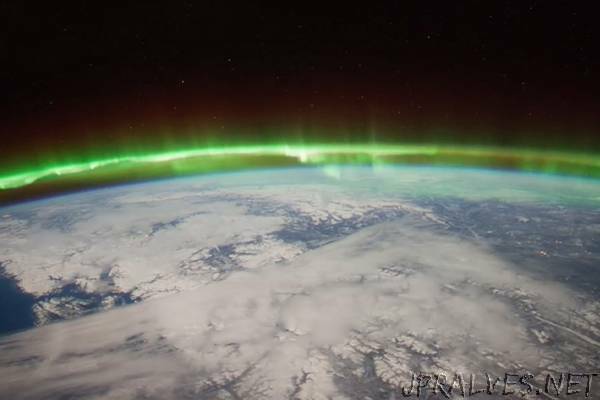 A recent study led by Larisa Goncharenko of MIT Haystack Observatory, available online and in the forthcoming issue of the Journal of Geophysical Research: Space Physics, examined a major SSW from January 2013 and its effect on the nighttime ionosphere. Decades of data from the MIT Millstone Hill geospace facility in Westford, Massachusetts; Arecibo Observatory in Puerto Rico; and the Global Navigation Satellite System (GNSS) was used to measure various parameters in the ionosphere and to separate the effect of the SSW from other, known effects. The study found that electron density in the nighttime ionosphere was dramatically reduced by the effects of the SSW for several days: A significant hole was formed that stretched across hemispheres from latitudes 55 degrees S to 45 degrees N. They also measured a strong downward plasma motion and a decrease in ion temperature after the SSW. These significant results from Goncharenko and colleagues are also featured as an AGU research highlight in EOS. Understanding how events far away and in other layers of the atmosphere affect the ionosphere is an important component of space weather forecasting; additional work is needed to pin down the precise mechanisms by which SSWs affect the nighttime ionosphere and other coupling effects.